Something ancient and alchemical happens on a wilderness waterway. What we call news disappears. The word “media” sounds more like a song than a klaxon. Our bodies bask and bend, and minds follow. A pure, universal solvent dissolves facts and transmutes elements. In spruce and eagle we sense our wild genetic roots. Water and air and rock concoct a rapids, an elixir to drink in at dusk. The best transcendence? We do not seek or preach perfection. It merely happens. It takes three hours to find our philosopher’s stone. At 6:30 a.m., shivering in the air of early September, we’re ready to go, to leave our solid town-flesh behind. We’ve piled our gear into a muddy pick-up and are carried into the woods, bouncing over ruts and wash-outs. The driver, affable by Maine standards, answers questions but volunteers little. Conversation stumbles, halts. Logging trucks thicken the air with dust. In the middle of nowhere, a traffic jam appears: we are stopped by a backhoe covering a culvert with sharp, black pieces of slate. We can’t yet imagine making gold out of this. At last we reach the river’s edge. Unloaded, our stuff lies in heaps of metal and plastic and fabric. We lade the canoes and they groan, heavy as oxen, and we get in and try to push off, and the bottoms scrape horribly on the pebbles of the shore. We stop for a moment, reluctant to lose the earth’s embrace. The driver leaves, perhaps smiling. But then we take deep breaths and go, melting into water, moving smoothly and quietly, and the only carbon we burn is our own. There are no harsh sounds of industry, just the swish of paddles, and we exult. We have slipped the surly bonds. The way north, downstream, shines in the sun. Yet we are neophyte gliders, we three, father, daughter, daughter’s friend. In the rapids, we don’t slide over or around rocks, we scrape them, bang them, leave paint on their crowns. It will take a day or two to outwit physics and float free. More than once, the elder of us, paddling solo, runs a riffle backwards or is pinned athwart a granite crag, stuck and mortally chagrined. A hard, crashing diagnosis, like running into a rock, caused this gift of a trip. A solid tumor in the prostate had grown; bad cells threatened to leak into lymph and blood. The operation (steel cutting, laser burning, hope flowering) was followed by Christmas, and under the tree the daughter placed a present, a book on the Allagash River and a map of wilderness. It can’t be said that alchemy stopped the cells from slipping their bonds (a surgeon and his robot did that), but certainly now, in late summer, water and trees and sky complete the healing. Each evening, we return to land. The hardness of ground feels softer now, cushioned by grasses. We are lighter, stronger. Packs lose weight (or we gain muscle). Tent pegs easily push in. A backless bench is as comfortable as a La-Z-Boy. Our heaviest gear, the sleeping pads, uncoil and self-inflate, like magic. Every afternoon, between setting up camp and cooking dinner, the celebrant hangs a hammock and suspends himself between heaven and earth. In the rapids, air whitens the water. At first, we try to conquer currents, fighting for safe passage among brigades of stone. Then we learn to read the water, looking for Vs that show channels, following a trail of bubbles along the path of least resistance. The canoes are no longer vectors, straight and sharp. They slip and slide like otters. A moose grazes in the river grasses. She moves slowly along the banks, well aware of the humans and not giving a damn. She has lived here for thousands of years, she will never be tamed, no rough beast will ever ride her out of water and into war. Time is water flowing. Several times the first day, we play the game of time, try to pin it down. Closest guesser by our one watch wins first prize, whoops in triumph. By day two, thanks to re-acquaintance with slants of light and growls of stomach, we predict with great accuracy, and the cheering dies off. The conventions of civilization fade like newsprint in the sun, and the river carries us on. Time expands, or collapses, we don’t know which. Which way is time running? We wake one morning and water beads and runs down tent walls, inside and out, and sleeping bags are moist, and skin feels soft. On the river again, we can see only a few yards ahead. Water in air has overtaken our world. The future is obscured, and who cares? We put faith in our deltoids, our synapses, and the embrace of the river. Where we’ve been is the same as where we’re going. In the wilderness, we air breathers actually think about air. There’s fog and cloud, and a silver maple rustling, and an eagle flying on billows, and perfumed molecules of pine, and a strong gust pushing one of us helplessly off course. Air is purely given, purely taken. And that’s about all we think about. Whole days pass without intellectual content, no one thinking of money or books, performance or prosody. (Such things, like over-thinking left-right steering problems in a canoe, only get you up a bank.) 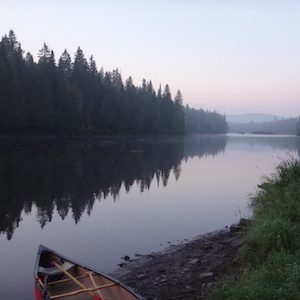 We are body-concentrating on water and air: watching the current, scouting for rocks, gazing at trees, hoping for moose, unloading canoes, soaking up sun, deep-breathing. We do not dwell on the past. There’s no thought of the past at all except the deepest of pasts, our own wild genes so obvious everywhere we look. No one analyzes the present. No one thinks, how am I coping, am I happy or sad, what’s the meaning of meaning; it is all feeling, of cool water splashed by a canoe or dipped by a hand, of warm sun on bare legs, of the taste of bacon and eggs intensified in the clean air. Even at night, in some hours of wakefulness, we look for stars or clouds, not the read-outs of clocks; hear rustlings, not sirens; feel contentment, not redress; smell pine tar and river mud, not exhaust from the interstate; touch the fabric of a tent and not a bottle of antacids. And there is no obsession on the future, except the exciting prediction of rapids and shoals. We think, of course, but hardly in the normal way. Normal thought makes the body seem weak, burdensome. Not here. The coordination between mind and body is seamless. The wide, wild river makes sure, its ripples and riffles and eddies and rapids demanding attention, its deep parts opening to slow, strong paddling, its rocks, hidden and seen, calling to us constantly to miss them. The highest thought, here and everywhere, should be a paean to the elements. In the morning, the little propane stove burns blue as the sky, boiling the river water, which scalds the coffee grounds, which perfume the air. In the afternoon, the sun is the best of radiators. In the evening we light a campfire and, like primitives, roast our meat and warm our hands in the sudden chill and sit talking of quiet things in the heart, even though the fire’s heart is violent plasma, fusing earth and air, snapping and shedding sparks, white and orange and red. Yet it is the calmest thing imaginable, like exploding stars twinkling in the night. Those little sparks shoot off into darkness, and we comfort ourselves in insignificance. Most ancient thinkers added a fifth element to the essence of nature. This is the one you feel on the river but reason out only after you leave the river behind. It’s the one that gets you into trouble, the theology that should be left out of this cosmology. Back in your regular life, in your analytical hours, you think there has to be some meaning beyond moose and love and riffles and bacon. You despair over the infamy of war, the malice of cancer. “Oh God,” (maybe even said literally), “where is the justice?” And then it gets worse. You wonder if some Big Bang or Big Baker cooked all this, if there was a definite beginning, and if there was a start, will there be an end? It does seem so. These days of soil depleted and air polluted and seas rising and forests burning seem like the last gasp of the Anthropocene. The four elements of Nature are turning into sermons, into the four horsemen of the Apocalypse, like avatars clouding our suns and ghosting our selfies. Editor’s note: “Elements of the Allagash” is an excerpt from Jim Krosschell’s essay collection, One Man’s Maine, to be published in May 2017 by Green Writers Press. Jim Krosschell divides his life into three parts: growing up for 29 years, working in science publishing for 29 years, and now writing in Massachusetts and Maine. His essays are widely published; a collection of his Maine-themed essays will be published in One Man’s Maine (May 2017) by Green Writers Press. His book Owls Head Revisited was published in 2015 by North Country Press.